Your hands are your first defense against disaster on any vehicle with handlebars, whether an ATV, street motorcycle or dirt bike. With access to all your accessories, it’s hugely important to keep your hands at peak performance just like any mechanical part of your vehicle. Numbness in the hands is an issue that should always be on the mind of the off-roading motorist, especially as temperatures begin to drop. Here are several important things to keep in mind. Workers whose jobs require the use of power tools may be familiar with a syndrome called vibration-induced white finger. Vibration in the hands over a prolonged period of time causes poor circulation, which in turn causes numbness in fingers, the entire hand, and in worse cases, the wrist and forearm. There are methods to prevent vibration-induced white finger. Cold or wet hands should never operate an open-air vehicle, as low body temperature can make you more susceptible. Smoking cigarettes also inhibits circulation, causing numbness in the extremities quicker. A tight grip transmits more vibration, which causes an earlier onset of numbness. A loose grip, on the other hand is unsafe, so riders should seek a comfortable grip without straining muscles. Engine type is another factor to consider. Dual-sport motorcycles with one cylinder, often with engines over 600 cubic centimeters, are known as “thumpers” not because of the thumping exhaust as many assume, but because of the vibrating nature of a thumping cylinder. Always take note of the rattle on the handgrip when you start a bike. It may seem irrelevant initially, but consider how it will feel to wrap your palms around them for hours. Aftermarket parts such as heated handgrips and brushguards will keep the cold away longer. Padded gloves are a must. For many riders, good gloves can be the difference between full feeling and total numbness after a day of riding. You can ride until your hand is numb, relying on the last bits of feeling in your pinky and thumb to connect you to the throttle. You can shake your hands, stretch your fingers and do any combinations of made-up solutions to the problem, but it’s all taking your mind off the task at hand. Temporary solutions impair your crucial contact point between hands and bars, surrendering any sense of control. Only a good, long break from riding can regenerate your ability to get full use of your hands. You don’t want a drunk or fatigued airline pilot flying a plane, and you don’t want them to remedy the problem with coffee or some other quick fix. It is similarly true in motorsports that any physical problem that grows over a period of time will not be easily reversed without adequate recovery time. 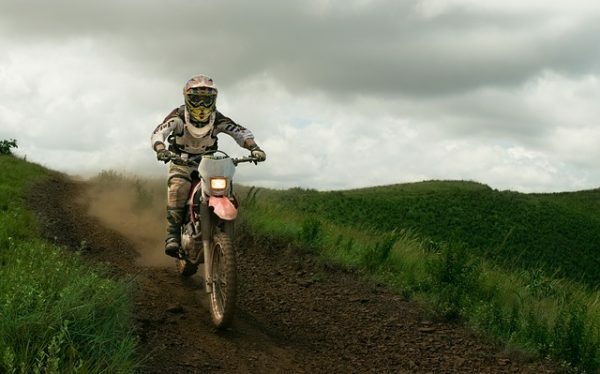 It is common for some numbness to linger shortly after riding, but if it lasts for more than a few hours, it is recommended to consult a doctor.